There comes a point where you have to say 'enough is enough'. 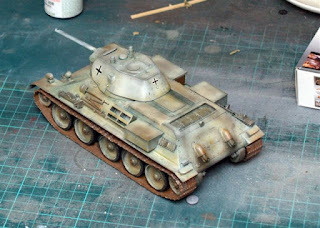 If I do any more to the T-34 then it will start to go downhill and end up as dark as my Jadgpanzer. I did make one mistake when spraying it such that I had to pad the Tensecrom Earth with some tissue, which promptly removed the white and the green below. I was left with a quandary. 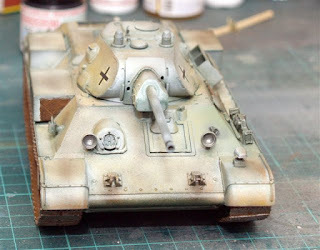 Having layered a lot of colour and weathering, how could I get a basic green background back to the rest of the model. The answer was two fold - 1. I created a shell hit on the panel and 2. This gave me the excuse for the colouration to be different due to some urgent touch up. I think 'I got away with it' (Shades of the Germans in Fawlty Towers - grin). You can see this on the front right panel. I did say to my friend in the US that it is always tempting to keep working on it - he bet me $1 that I couldn't stop - but I did - so there. 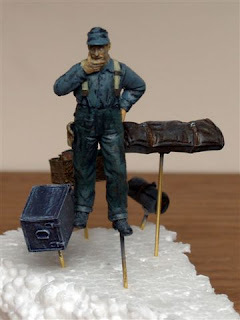 This picture is of the first figure I have finished for the diorama - plus the stuff to go on the back of the Stug - sticking out of the tarp. 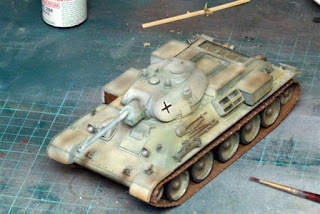 You have seen this in primer - here is the finished set.